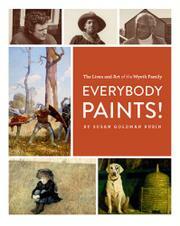 A perceptive, if undersized and overdesigned, introduction to a dynasty of American painters. Playing to her well-established strengths, Rubin (Delicious! The Life & Art of Wayne Thiebaud, 2007, etc.) does a fine job of setting selected works of N.C. Wyeth, his son Andrew and his grandson Jamie into biographical context and explicating emotional substrates in their art. This is particularly important with Andrew, whose pictures are often oblique expressions of private feelings or incidents. The analysis is, however, embedded in references to other family members (several of whom were also artists, though none of their work is illustrated or discussed here), along with moves to various residences, gallery shows, awards, honors and other details that will be less than compelling to young readers. Moreover, the type and background color scheme does nothing but call attention to itself by changing with every page turn (the purple type on gray background is a particularly unfortunate choice). Though nearly every spread offers a sharply reproduced image of a painting or drawing (or an occasional photo), the volume’s modest trim size cramps the often large originals.